This page was last updated on 23 October 2016. It’s a draft, and comments or further information would be very welcome. Expect further revisions..
Hook heights given are very approximate as the spinner can adjust them by up to 4 cm (1 1/2 inches) so any difference less than this is meaningless. 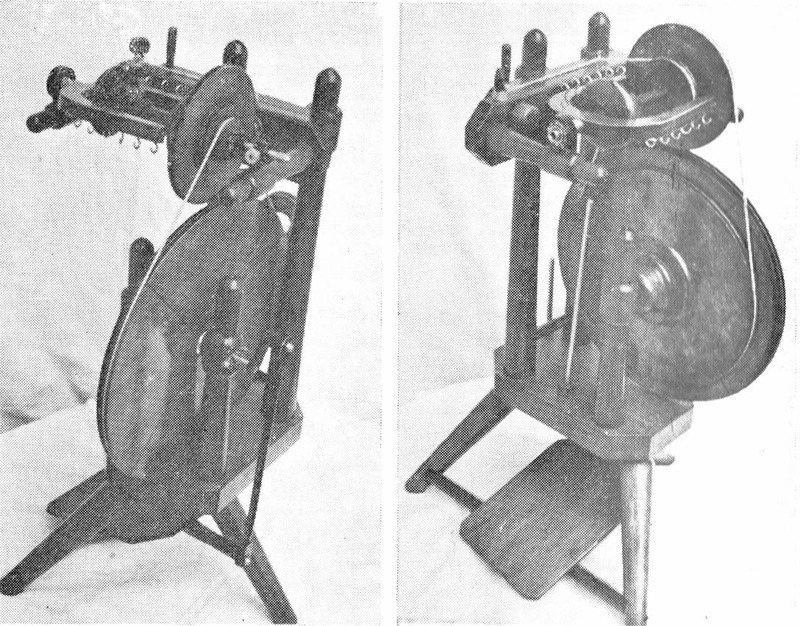 Treadle widths are measured at the front bar, and drive wheel diameters may be a little out as it’s hard to measure something with a curved edge..
Beulah Peacock writes about the first wheel made for her by her husband in The Web, August 1976, pp 8-9. Many of the features we associate with Peacock are not there yet: the table hasn’t the characteristic triangle shape of the Peacocks that followed; two support posts hold a mother-of-all and two horizontal maidens; the orifice is conventional not a hook, and the treadle extension is beside the back leg, not through it. The wheel above was photographed in the Ashford collection. It was donated by Mr Peacock’s daughter, and is claimed to be “The original wheel made by Mr Peacock”. 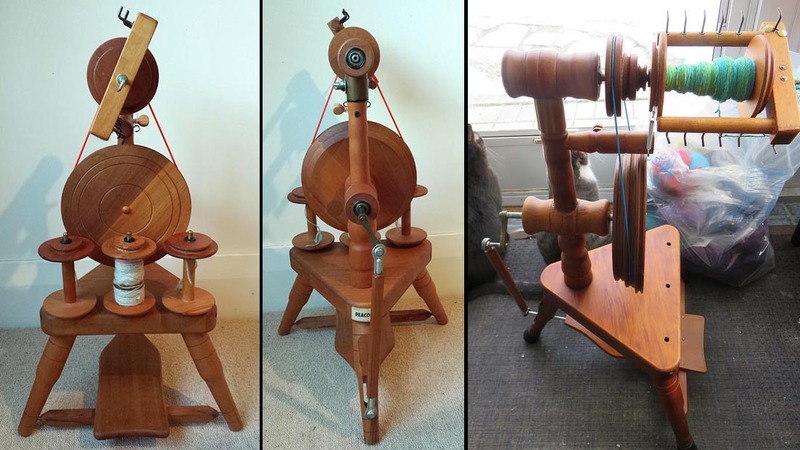 A hook has replaced the orifice, the table is a triangle and the plywood treadle is wider. 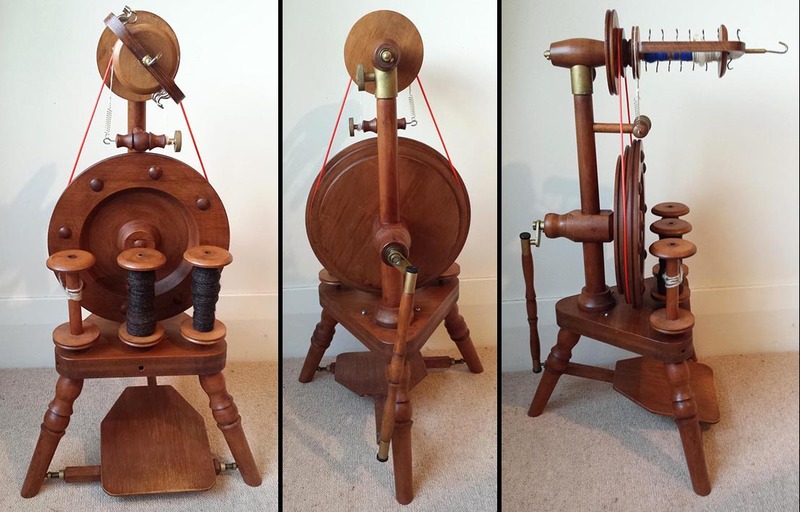 It may actually be the same wheel as the second one pictured in Mrs Peacock’s Web article, captioned “A new spinning wheel made by Mr Peacock, which is much lighter … and although the driving wheel is much smaller (9 1/2″ [24cm] in diameter) it is weighted with lead.” We can just see in the photograph that the treadle extension passes through the back leg. Previously I have given the name “original Peacock” to wheels like the 1982 one, below. I now know that this was a mistake, as the few that can definitely be attributed to Mr Peacock (apart from the Beulahs) look like the one above. It was purchased from Mr Peacock at his home in Plimmerton in 1979. These two wheels are almost identical to the 1976 one, with slightly different turnings (particularly the legs) and a longer bobbin. There are now 3 ratios (the earlier wheel looks to have had 2). It has many features that were repeated in the later Beulah wheels – the barrel-shaped head (the cylindrical piece behind the flyer), the concealed weights, and the turned legs. 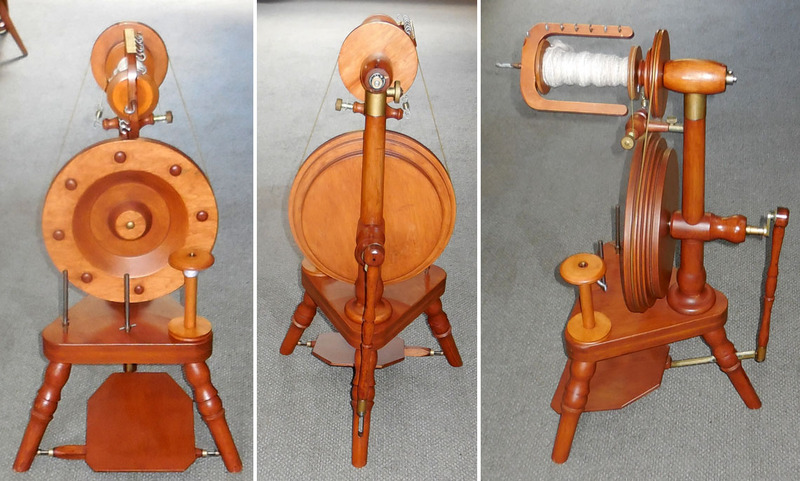 Unlike the Beulah it has the treadle extension (which is of wood) passing through the back leg. 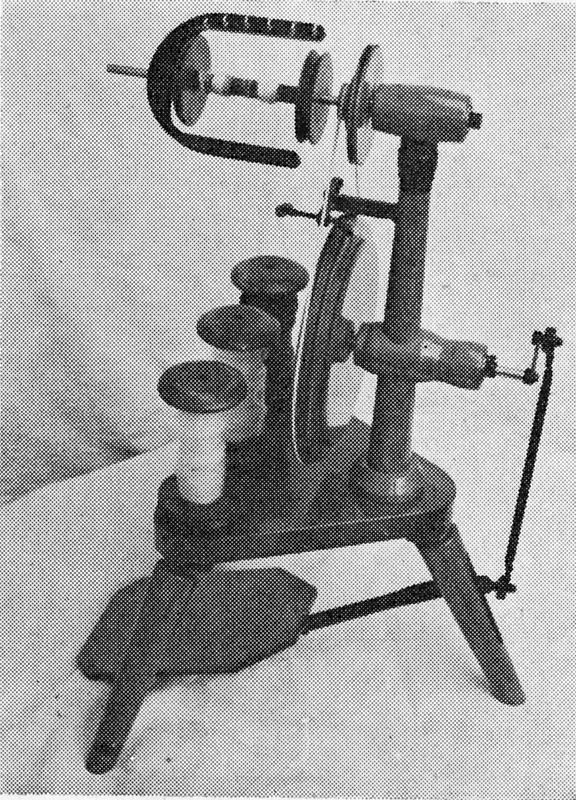 The flyer is a plain slightly squared U-shape and the plywood treadle is wide with rather squared-off corners. The two wheels illustrated have different types of bearing at the ends of the footman/conrod. Changes in bearings used at the different stages of Peacock are still being looked at. In the early 1980s Mr Peacock “retired” and sold the business to Karl Fomotor. This is one of the first wheels Mr Fomotor completed, purchased from him in 1982 by the present owner. The flyer is now made in 3 pieces and the head behind it has a more elaborate shape. The attachment for the scotch brake is still horizontal. The profile of the front of the drive wheel is different, and the weights (26 in all) are visible at the back of it. The legs are simple with almost no turning. 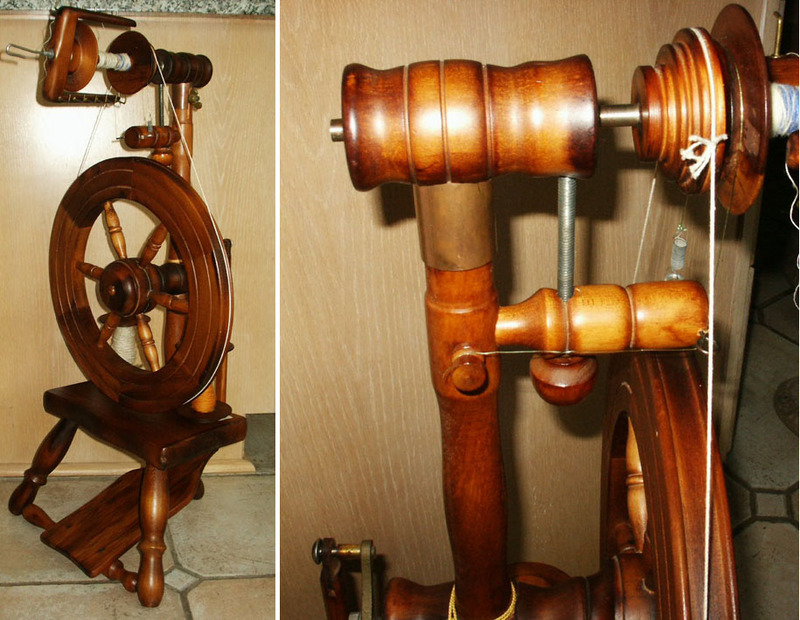 The treadle is now solid wood, and has narrowed to 14.5 cm (5 3/4 inches). leaflet1 – Wainuiomata address. An unassuming leaflet, possibly the first by Mr Fomotor. leaflet2 – Wainuiomata and Auckland addresses. The drawing is basically the same. There have been a few changes. The flyer has become a little sturdier and squarer. It still has the rather vulnerable scotch brake attachment – on one of these wheels, the owner had so much trouble with it she eventually had it changed to the later stub type., The hooks (if original) are are now square, not round. Weights still show at the back of the drivewheel, but there are fewer of them (20). 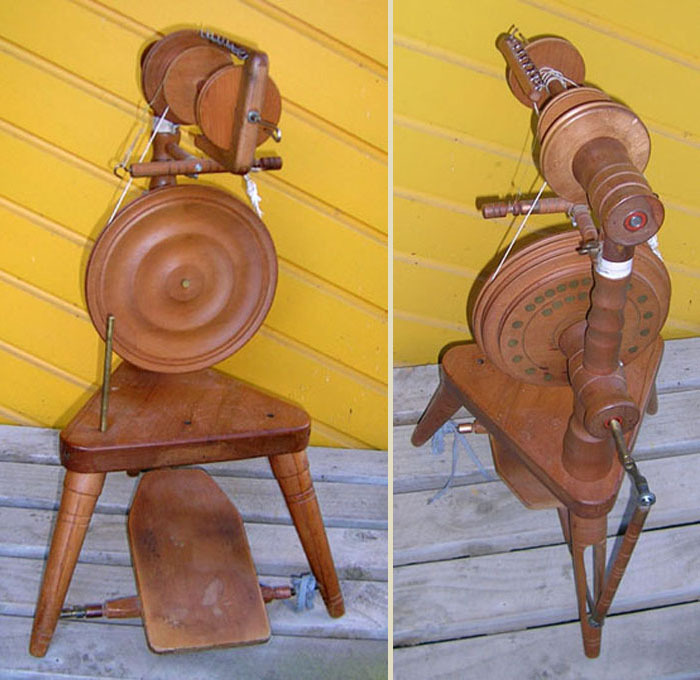 The legs are a slightly different shape and the corners of the treadle seem a little more rounded. The drivewheel is still 23cm (9 inches) in diameter. Most of the Fomotor/Simon Peacocks have lost their labels (sometimes there is a faded patch to show where it was) but this one survives. 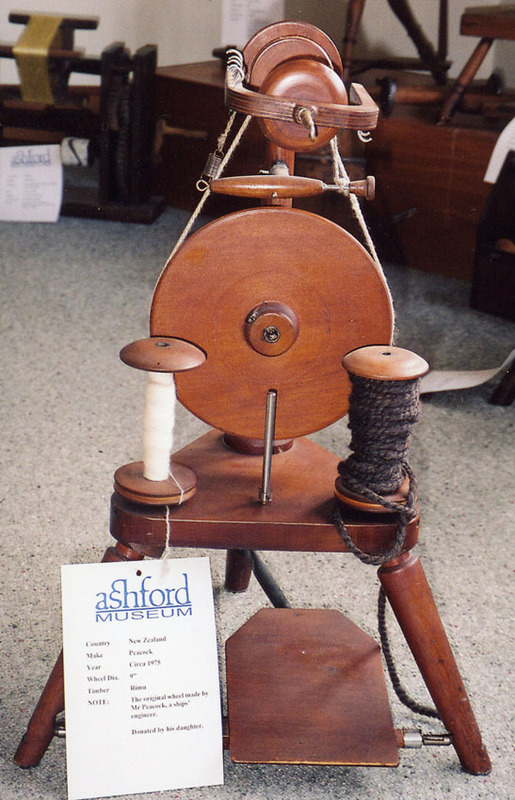 In their very useful page of guides for their past products, Ashford’s website includes a leaflet that covers the assembly of this wheel. It has only the Auckland address, and says the wheel was “manufactured for” Peacock. It shows a drivewheel with a flat front (clearly production is being streamlined). Surprisingly, the table is shown in the leaflet made from two pieces of wood, with a dovetailed joint across it: I have never seen a Peacock table that actually has this (economical?) construction. The scotch tension attachment is a stub, much simpler and less liable to get broken than the little crosspiece, and the 3-piece flyer now has round arms. 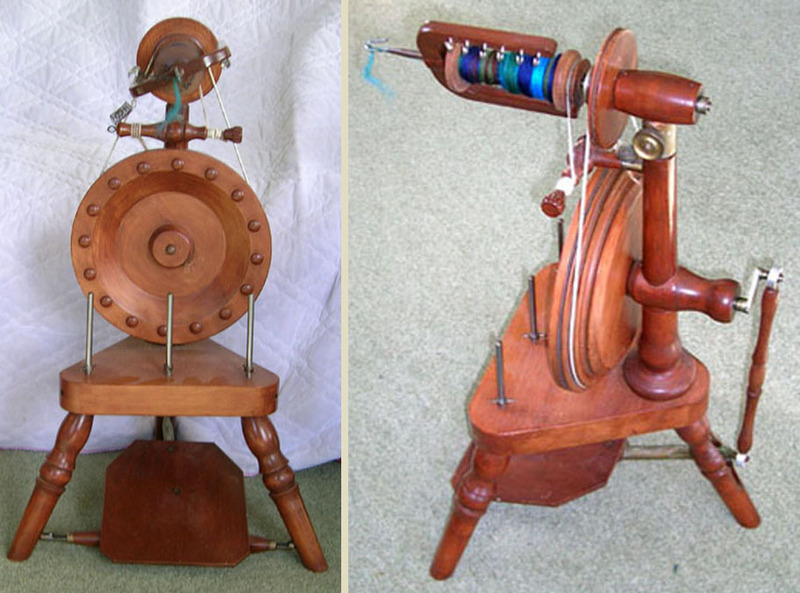 The treadle has narrowed, and is shown with a convex curve at the front. The wheels in the photographs above match the pictures in the leaflet (except for the dovetail joint). They are marked with a peacock logo on the table. 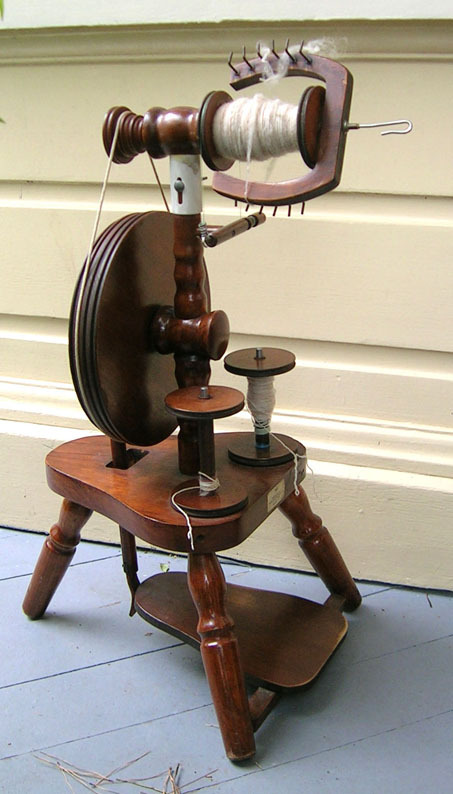 The treadle is more solid, its sides curve inward lengthwise, and all its edges are rounded. The drive wheel diameter has shrunk again, to 22cm (8 1/2 inches). 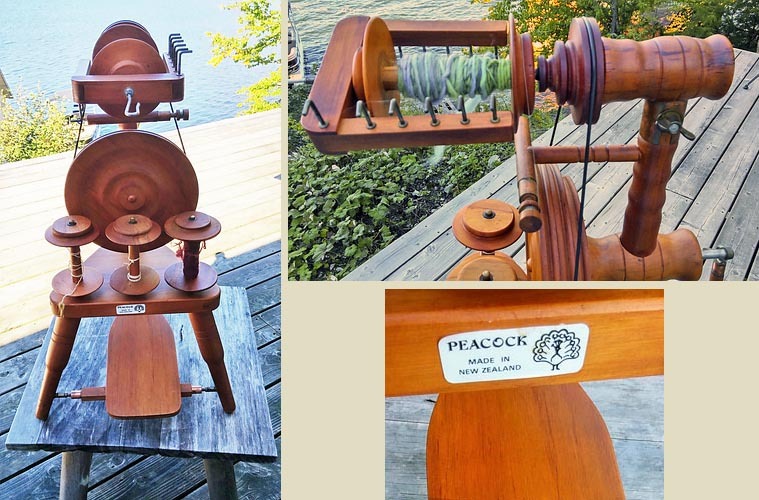 It now has just one weight at the back, covered with a wooden plug (shown in the inset)..
We also see Peacocks with a concave curve at the front of the treadle. In other respects they are very similar to the “late 80s” type. One of this group is known to have been bought from Eric Simon. Are these a batch commissioned by Mr Simon from a different manufacturer, not Ashford? The Ashford ones all have the peacock logo on the table, but one of these retains a very different label, on the back corner of the table, with just “PEACOCK”. There is some evidence that the Atlas Furniture Company in Burnside, Dunedin made some Peacocks. Could these be theirs, made to the same specifications as those commissioned from Ashford but with minor differences? If so, they may well be earlier than the previous group, from before the manufacturing was done by Ashford and later the company acquired by them. Again there is a single weight in the back of the drive wheel, covered with a wooden plug. By this time the business had been transferred to Ashford. The owner of the wheel pictured remembers that it was ordered for her from Christchurch or thereabouts (Ashford in Ashburton? Hands Ashford in Christchurch?) and at that time she wrote 1984 under the table, so the date is secure. It has many differences from earlier Peacocks. 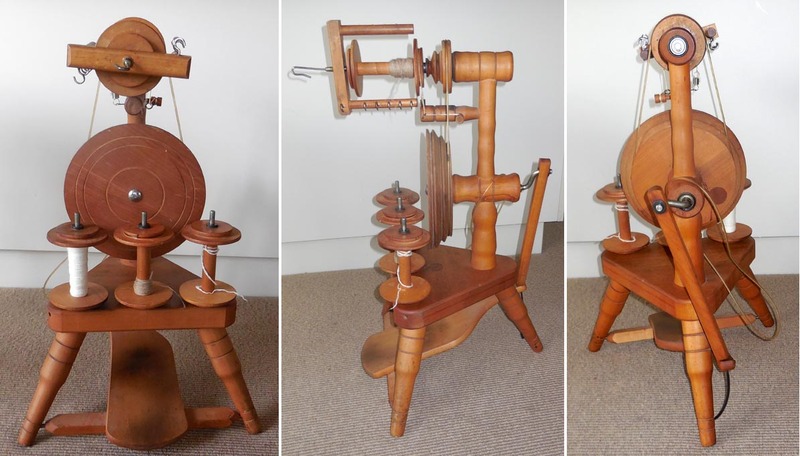 An obvious one is that the support post is all in one so the head can no longer be detached or its height adjusted: the drive band is now a synthetic stretchy material, The treadle extension runs beside the back leg not through it. The effective Rose joints at the ends of the footman found in the previous models have been replaced by simpler joins, and the footman itself is a plain strip of wood. Round flyer hooks have returned. There is still a single weight in the drive wheel, covered by an insert of wood. The drive wheel itself is still 22cm in diameter (8 1/2 inches). The Tui was a variant made by Fomotor and/or Simon, intended as an economy model. It has curves where a Peacock has corners. The construction is cheaper and simpler. Beulah wheels were made by Les Peacock in response to continuing demand after he sold the Peacock business to Karl Fomotor. In many ways they are a reversion to his original style (the 1979 wheel, above). The hook is a little higher, at around 69cm (27 inches) and unlike other Peacock wheels the post cannot be detached from the table. 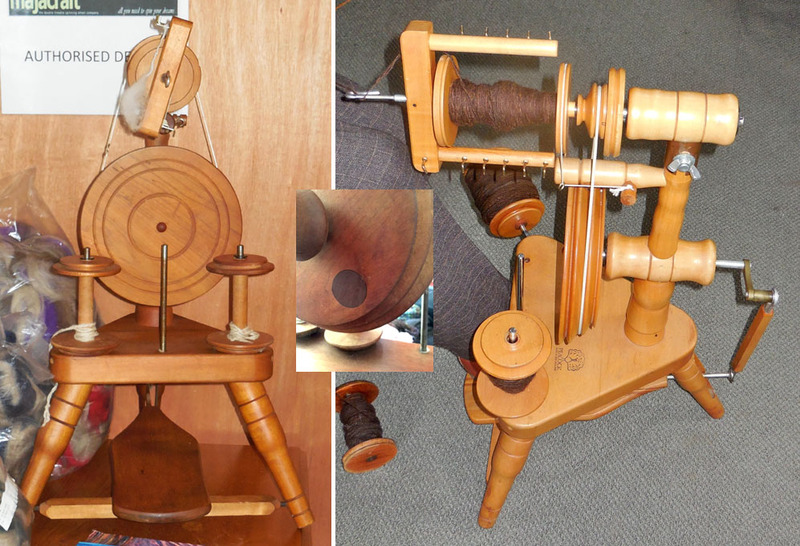 The most noticeable difference, though, is that the treadle extension is beside, not through, the back leg. What have I missed? if you can fill any gaps, please get in touch!